Two of the blood tests were for coeliac disease. One, a genetic test, the second an antibody test. The genetic test came back as positive, meaning simply, that he has a genetic predisposition to develop Coeliac disease at some point in his life. Many people are genetically predisposed but may never actually develop coeliac disease in their entire life. His antibodies test came back negative. Meaning that his body isn’t creating antibodies to fight the gluten in his system. Meaning they can’t diagnose Coeliac disease. We were told that he probably has a non-coeliac gluten intolerance alongside the dairy and soya and to keep him off all three for at least a year, when they would then look at slowly introducing each back into his diet one at a time. Obviously by that point he was already not eating gluten so they couldn’t retest but she made it clear that they wouldn’t have anyway. I left that appointment a bit flumoxed and unsure of what to do next, or what to say when asked why he can’t eat certain foods. That old saying ‘if it looks like a duck and quacks like a duck….’ kept popping into my head.He is genetically predisposed to develop Coeliac, he has all the right symptoms of Coeliac, yet he doesn’t have Coeliac? Surely he has to be darned unlucky to develop an intolerance to wheat/gluten too? Of course at the moment it doesn’t really make any difference either way as far as treatment is concerned, he just can’t have anything with gluten in. But in the long run, the health issues that are associated with Coeliac disease, such as vitamin deficiencies and gut complications, could be life threatening if he starts to eat gluten in the future without showing any visible symptoms, which is fully possible. I had a little look online, as you do, and it seems that false negatives are quite common, particularly in little kids, and that there is even a group of people who will always test negative to the coeliac antibodies even if there is lots of damage being done internally due to being IgA deficient, IgA stands for total immunoglobulin A. You can read more about this on the Coeliac UK website as I can’t even pretend to understand it enough at the moment to explain and I wouldn’t want to pass on any incorrect information! There is a blood test they can do to find out if this is the case but we will have to wait until next year when he gets his next appointment to see if they will even test for that. So for now, we carry on as we are. Sometimes if I’m ordering food out, like a McDonalds Happy Meal for example, I ask for the burger without the bun ‘because he is coeliac’ it causes less confusion, they don’t even bat an eyelid and he gets a freshly cooked patty in a separate package so I know that it’s never been near a bun and he is safe to eat it. Yet I still berate myself for lying because we just don’t know! Cooking for such a restrictive diet isn’t too bad, buying prepackaged food is a total nightmare though so I’m glad I was already in the habit of cooking form scratch! 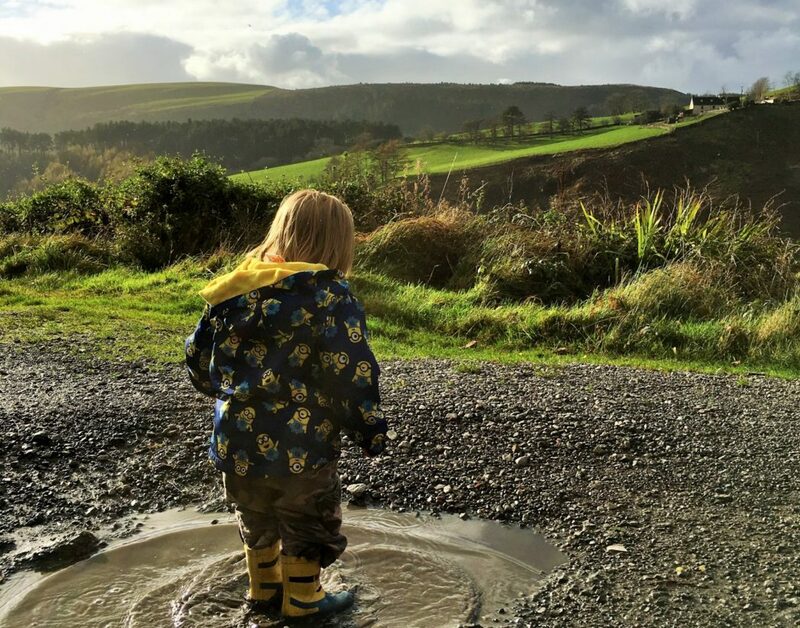 Of course we still have the occasional slip up, usually because he ‘shares’ food off someone’s plate, but no matter how poorly he’s feeling, splashing in puddles is always a sure to take his mind off it. Have you dealt with testing for coeliac disease? I would love to hear your experience. Thank you, it was a ridiculously long wait, we were told in September that the paediatrician was ‘a bit behind’ and we didn’t get seen until late November! I live in the States, where we have our own issues with healthcare, but if I understand correctly, you had no choice but to wait to see that particular pediatrician? That’s right Jeremy. Here our first point of contact for medical issues is a GP (general practitioner). If the GP feels like you need to see someone more specialised then you get referred to see a more specialised doctor at the hospital. Unfortunately there are waiting lists to see them and often long waits in between appointments! Thank you Karen, it does save me going through the whole spiel every time! Thank you Julia, yes it’s lucky that the treatment is the same either way! It is so frustrating isn’t it? I wish we had the money to see a private doctor, I bet we would have the results almost immediately! Thank you, sometimes I wonder if I have any idea what I’m doing at all!